I've got to read Bitter Spirits. It sounds amazing and I really need a gripping read! Riley sounds like a character I can get behind, too. I am SO glad you enjoyed Bitter Spirits, Keertana! Jenn really is something else, isn't she? She gives her readers exactly what they want without making it seem like fan service. I agree with you about PNR (not my genre, it gives me allergies), but also about Aida and Winter - they are both quite impressive. As sad as I am about the ending of Cady Bell, I'm very much looking forward to the next installment in this series. Interesting reviews. I think I might have to see if my library gets Bitter Spirits. I'm always on the fence about romance novels but every now and then it's nice. 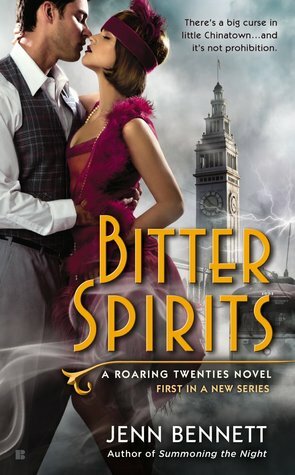 I see quite a few recommends for Bitter Spirits but I thought it was a debut for the author. I probably missed the fact that the author had other novels. But if they are recommended by you, I feel safe in picking one up to read. I LOVED Bitter Spirits as well, Keertana! Jenn Bennett's writing is witty, funny and the romance was full of fun and smoking hot! I actually liked Just One Night a little better than Grace's story. The history between the couple gave it a little more weight for me. Nice to see you enjoyed this one, too. oh gosh everyone I know seems to love Bitter Spirits, it's odd that I have not jumped on the wagon yet. Hopefully I can clean up some time for it, cause it sounds like a book I would enjoy. YAY! So glad you loved Bitter Spirits too Keertana! I've heard great things about the Arcadia Bell series from both you and Maja, so that's definitely on my list now and I can't wait. I'm super excited to meet Winter's brother next, I'm ready to go back into this world already. Beautiful reviews as always! Everybody's been reading Bitter Spirits and what's most enjoying it. I'm not surprised though because from your review what's there not to love. It has amazing characters and is set in one of the most interesting periods in history. Bring it on. For the second one I haven't heard of it. And it does sound interesting but I think it's better fit for my co-blogger not me. So clearly this means I should be taking note of Jenn Bennett, right?? You know I adored The Diviners, K and while I haven't read any paranormal romance/ urban fantasy in a while, it might be time to dive back into that genre. thanks for the rec! I've seen so many raves for this new Jenn Bennett book that I'm very excited! The mix of genres sounds so fun, and seeing your high rating is very promising.